Now that most people have smartphones, we’re taking more and more photos, and while selfie sticks are handy to get a shot of everyone – that’s so 2014. Want to take your photos to the next level? Check out Podo! In short, Podo is a camera you stick to the wall (most surfaces) and control it from your phone. skateboard is not a full size skateboard. 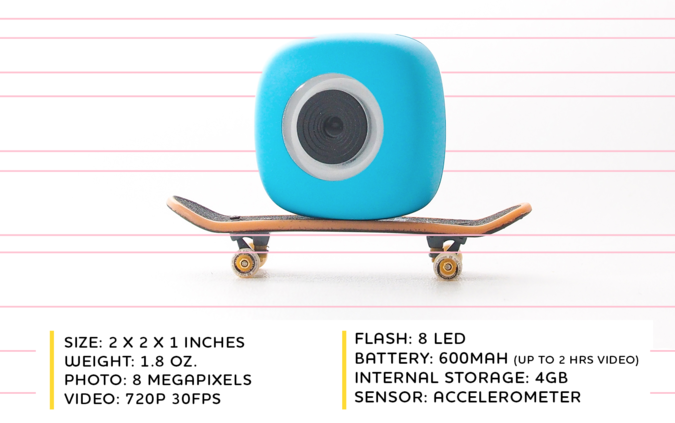 This 8MP shooter not only takes photos, but also video (720p), takes time lapse shots, and sends them to your phone via bluetooth – so you’re able to share it right away. It’s probably better if you see it in action. This little gadget comes in 2 different colors: blue and red. A third color will be announced now that Podo has met their stretch goal. The Podo ranges in price from $79 to $700 (for 10 Podos). The retail price will be $99, and you can reserve yours now via Kickstarter for $89. Ready to back this project? Click here to head to their Kickstarter page!